adidas is ready to add their newest member to the innovative 4D catalogue with their latest Alphaedge 4D sneaker. The Three Stripes brand are really stepping their sneaker game up with the launch of the Alphaedge 4D, and what’s not to like from this futuristic and alienlike sneaker. We’ve already seen an adidas sneaker, the original 4D model, made with a 3D printed midsole, and now it’s the Alphaedge 4D turn to hit the spotlight. But let’s talk a bit about the 4D model sneakers and what they are all about. 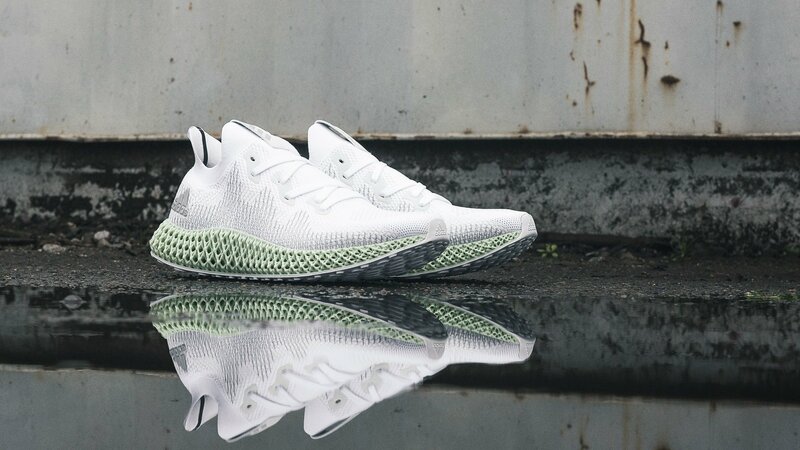 It all started with the Futurecraft 4D running shoe, which was the first ever running shoe based on a data-driven design made from a digital light synthesis technology. All of this might sound too fancy to understand, and somethings might be a bit hard to understand, but luckily we made this blog, so let’s get a bit more geeky and talk about the techs. The Alphaedge is made with the Futurecraft midsole, which is crafted from light and oxygen. This special combination secures a controlled energy return, and this will provide a long-lasting cushioning and stability for when you run, walk or look on-point in your zone. The Futurecraft midsole is pioneered by the tech-company Carbon, and is, hold your horses, 3D printed, and is achieved by transforming liquid into solids and carving it by using light and oxygen. The Primeknit upper is made in a white colour with a pattern, a toned and minimalistic design, while the adidas logo and the Three Stripes are visible in a greyish colour on the sneaker. adidas has also made a complete look, by taking the pattern from the midsole, and combining it into the upper, giving the sneaker a true unique look. The Futurecraft midsole is made in adidas’ popular ‘Ash Green’ colour, giving the sneakers an uplifting look, while making the 3D structure standout even more.